Much, much before life started bursting out of the ground, I had this grand idea of growing every single vegetable/flower/legume known to man on the Uprising Seeds website (check them out, if you haven’t already). I scribbled down a budget and a way of getting my dream garden into play. On my list of seeds to buy, I chose edible flowers. I had no idea what I was going to do with them but the simple idea seemed so novel to me. Last summer, a new friend (I call people friends very easily) – who graciously allowed me to carpool home with her – told me about this world of Pacific Northwest native flowers and plants that she knew about. A believer in natural remedies she told me all about her garden and the things she bottled and made from the abundant wild we have here. It made me happy to listen to her, knowing that I would never get as close as she is to the pulse of this earth. 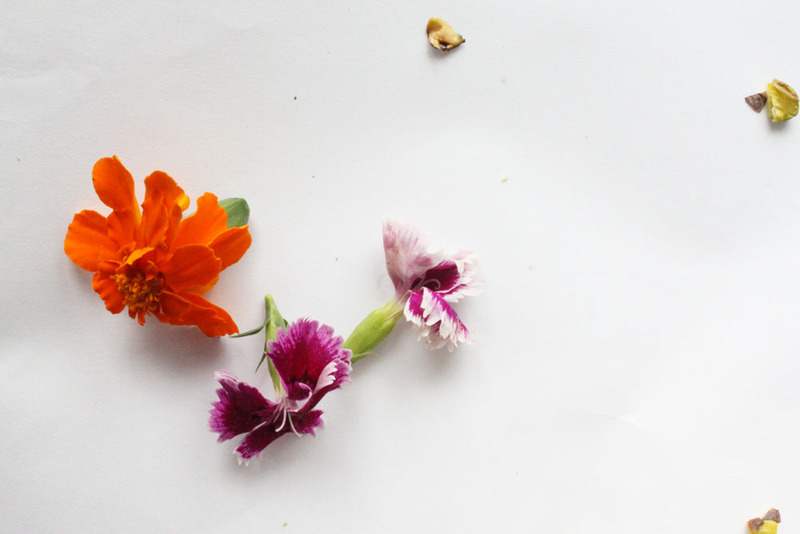 Buying edible flower seeds was my way of trying. Before you start to pat me on the back, know that there aren’t any flowers yet. The calendula is still a wee one and I’m still waiting to see how the rest turn out. I’m okay with waiting. Thankfully, a local grocery store that I obsess over had their own selection of carnations and marigolds in an edible flower mix. I brought it home with me. Using these flowers as garnish for savoury and sweet food was an incredible learning experience for me. I would have never thought to do it if it wasn’t for my friend and I would have NEVER blogged about it if it wasn’t for this Edible Flower Potluck hosted by the bestest lady behind Will Frolic For Food: Miss Renee B.! So maybe I cheated and I didn’t forage for flowers but what I did get was a information about what exactly edible flowers are! There are so many out there for us to learn about. If you do feel motivated, seek out some books on foraging from your local libraries. It’s crazy how nature just gives and gives and gives. I already know that I’m going to be making some dandelion salve and bottle it up for dayssss. 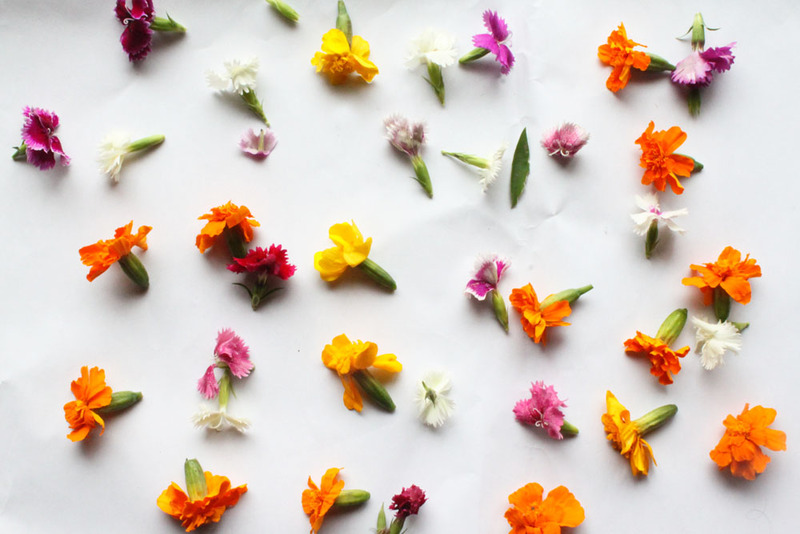 If I could give you one tip about using edible flowers (because it’s all I have) it is to try and use them as garnish first. Their beauty lies in their appearance. You don’t want to cook them down unless cooking them enhances their flavours. The marigolds and carnations I used worked perfectly as garnish (the marigolds were also delicious!). So start there. 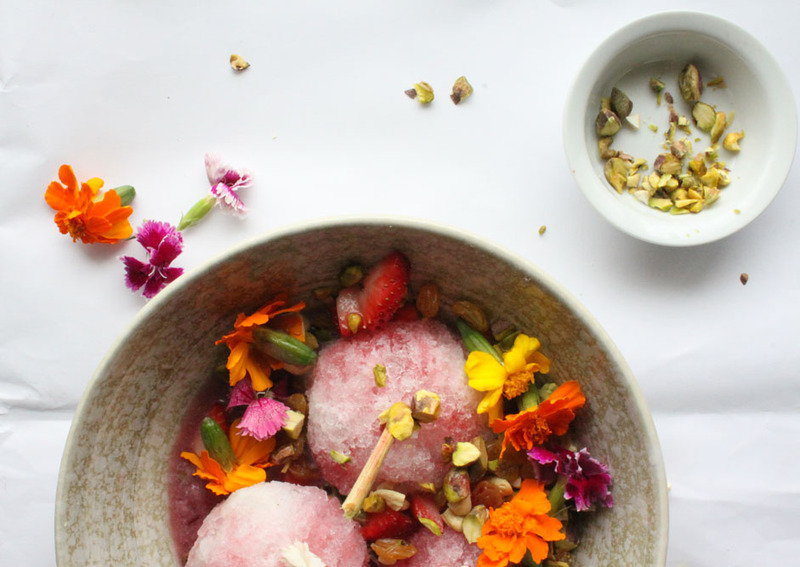 If I could give you more than one tips about edible flowers: I don’t need to because all my fellow potlucky duckys have it all covered! Thank you ladies. Check out their recipes posted at the end, feel the inspiration and have the happiest of springs. This is a great season. PS: The friend I wrote about in the first paragraph up there is also a freaking amazing photographer who lives in the same city as me. Currently she is collaborating on an moving art project with one of her artist friends Gianna King and the two of them have put up a kickstarter to help collect some of the funds for their trip. It’s beautiful and necessary work. If you feel like supporting them, here is the link to the kickstarter and short video on what they will be doing. Send these brave women huge huge virtual high-fives and donate if you feel inclined. 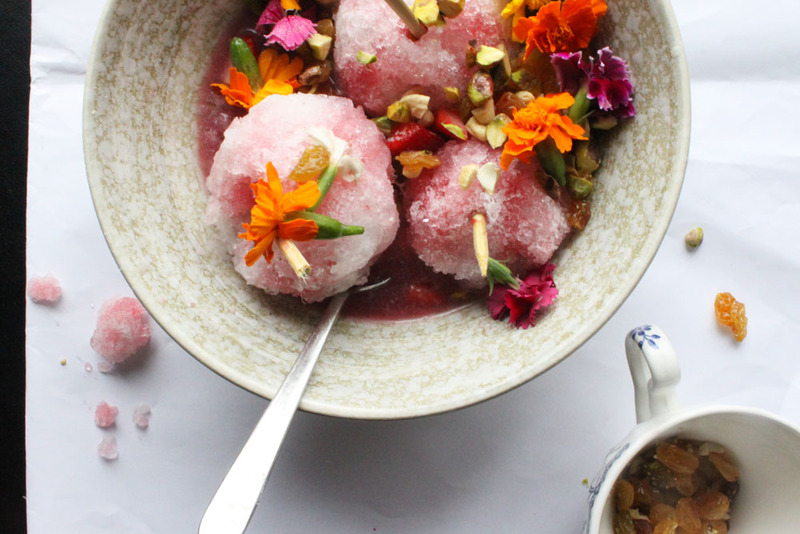 Golas are what we in India called our shaved ice treats. 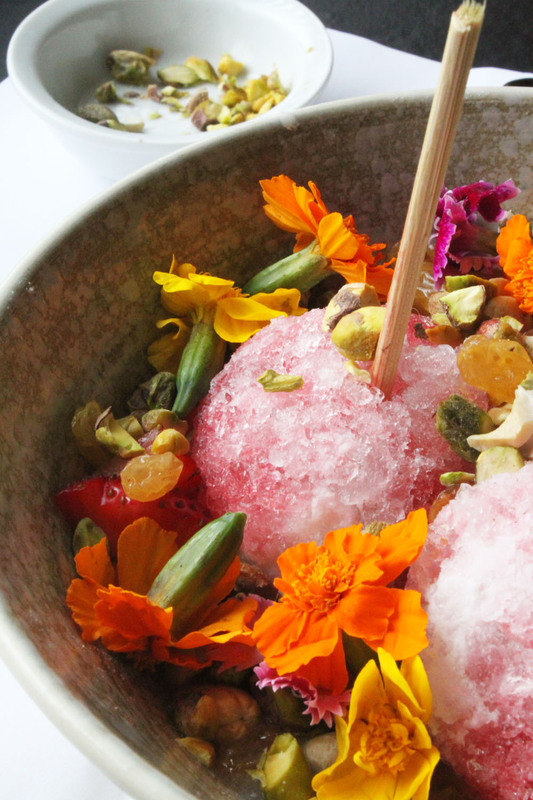 The ice is usually shaped by a steel cup and then doused with sweet, sour and spiced syrups. The colours will blow your mind and the flavours are endless. I didn’t grow up eating golas when I lived in Goa, but moving to Bombay in my late teens exposed me to this world of street and beach-side foods. I don’t care that my parents scared us as children saying that the ice-cream man used “gutter water” for his wares. They might have convinced me when I was 8 but I was a grown up and I would go on to consume as much gutter water as I wanted. PS: That was a lie. I don’t know how they handled their ice but I doubt it was from the gutter. Here is a video I grabbed from YouTube. On to more appetizing things. 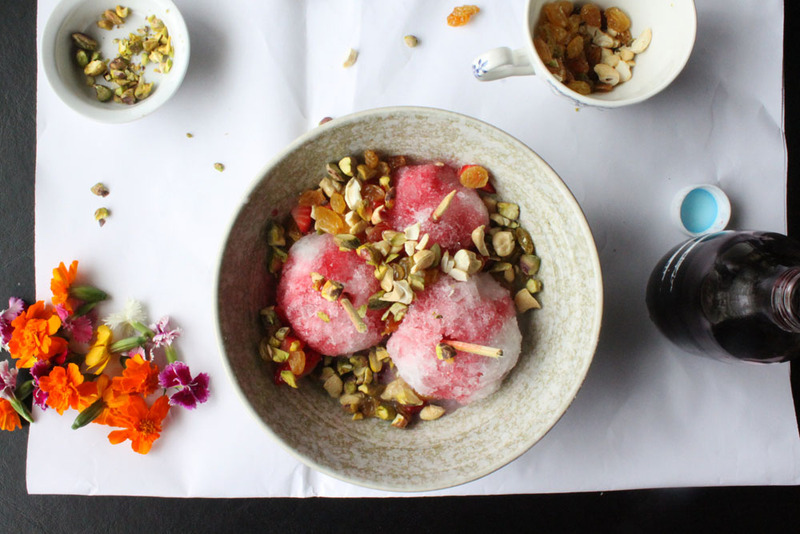 This version of a gola is made with coconut milk and hibiscus syrup. I wanted to add that condensed milk feel without using condensed milk because I didn’t have any on hand. Also, I love infusing coconut milk with vanilla. You can easily skip the coconut milk part, increase the amount of ice cubes to throw into the blender and pour condensed milk over the ice, should you so wish. 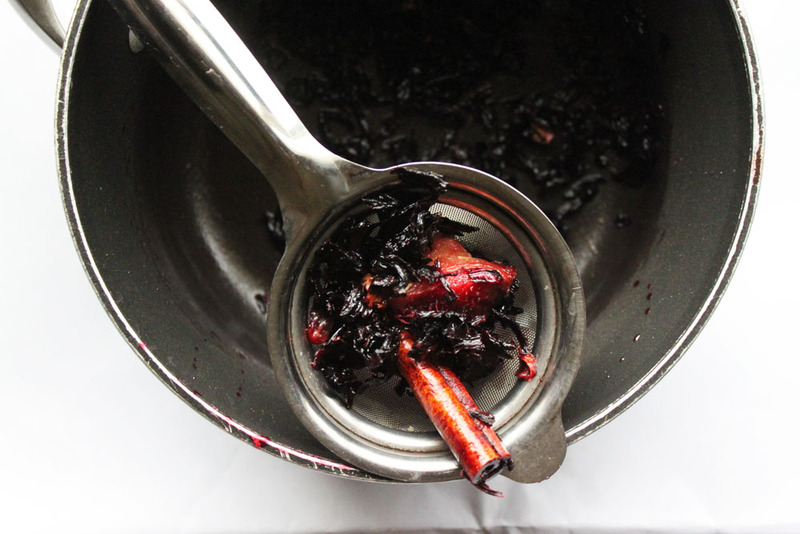 The recipe for the hibiscus syrup makes more than you’ll need. 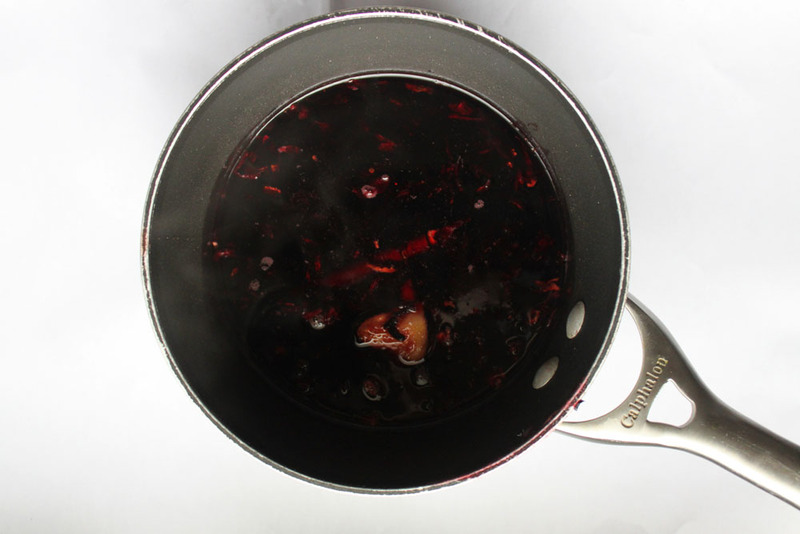 However, you can store it in the fridge and use it in cocktails, flavoured sodas, coffee, tea, desserts – pretty much anything you want to add that punchy hibiscus taste to. 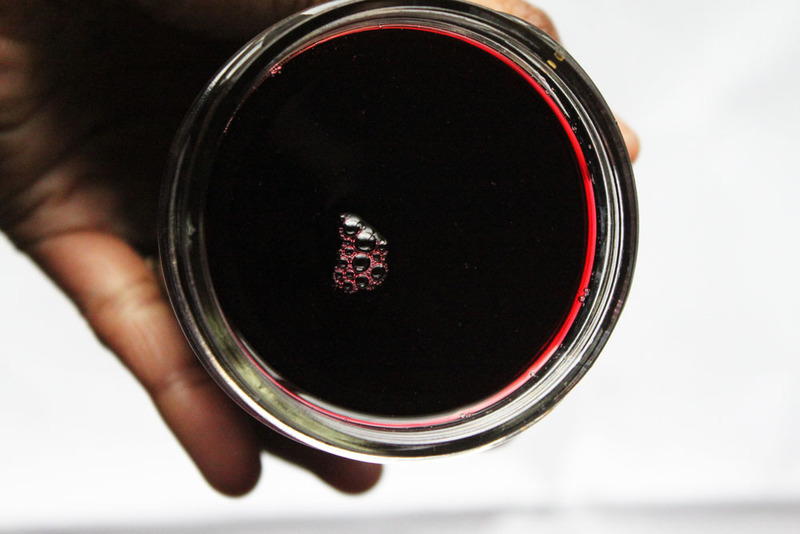 It also has this deep pink hue that works well as a food colouring. It’s so versatile and shouldn’t last very long if you love it. 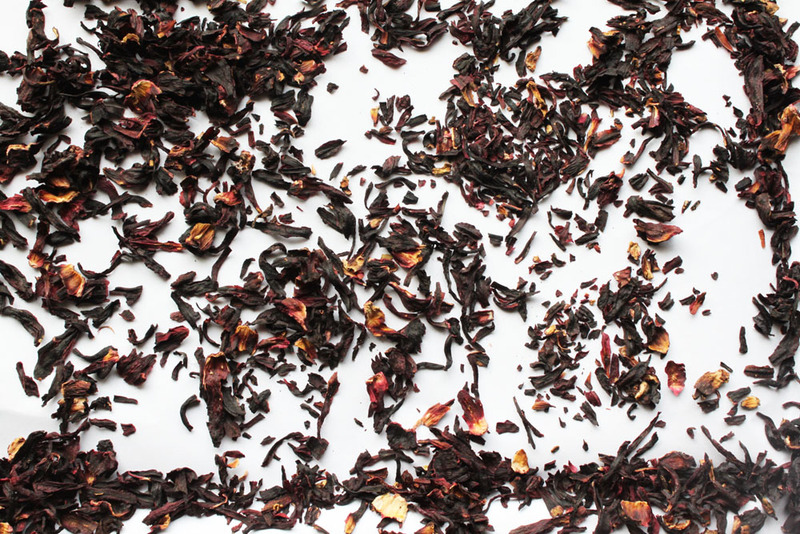 You can buy dried hibiscus flowers online or seek it our at your local whole/natural foods store or make it at home if it grows locally. Add all the above ingredients to a small saucepan filled with a cup of water on a little over medium heat. Stir gently until the sugar dissolves and bring to a boil on the same heat settings. Let the liquid boil for a minute or 2 without stirring and then quickly take it off the stove to cool. Once the syrup has cooled, strain it into a bottle and refrigerate. Empty the can of coconut milk into a small saucepan over medium heat. Grind up the cardamom seeds (or use already ground cardamom if you have some of that in your spice collection) and add it to the saucepan. Stir the coconut milk until it has turned into a consistent liquid/until the fat and water are combined. Let it come to a boil and once it does, add the vanilla extract to it. Take it off the heat and let it cool slightly. Once it’s cool enough, put it in the fridge for about an hour. It needs to be cold when you put it in the ice-cream maker. Take the coconut milk mixture out of the fridge and churn in your ice-cream maker according to the manufacturer’s instructions*. The coconut milk mixture will have a creamy texture. Scoop it into a freezer-safe bowl and put it in the freezer for an hour or 2 so it firms up. Pull out the coconut milk mixture 15 minute before using. Set up a high-speed blender and scoop up the frozen coconut milk mixture into it. Add the ice cubes to the blender and crush the ice on the pulse setting until it forms powdery ice granules. Be careful not to over-blend lest it turn back into water. 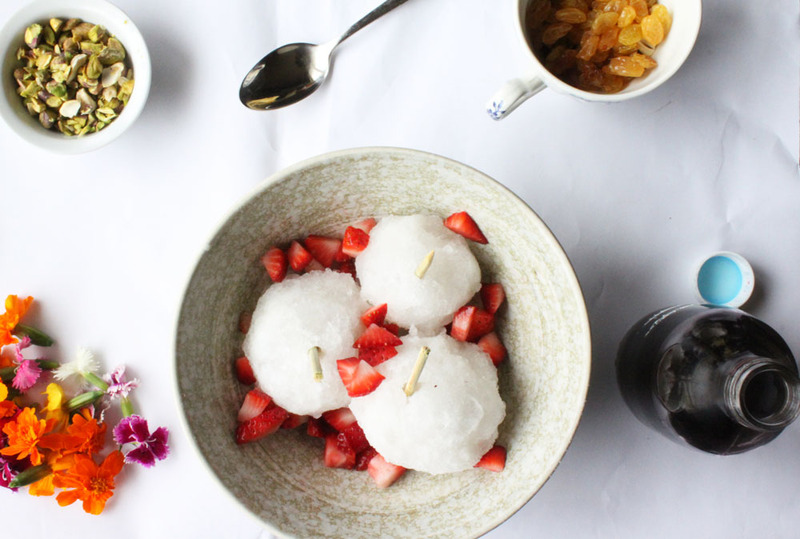 Scoop up the coconut ice gently and shape it into round snowballs or any easy-to-slurp shape you desire. 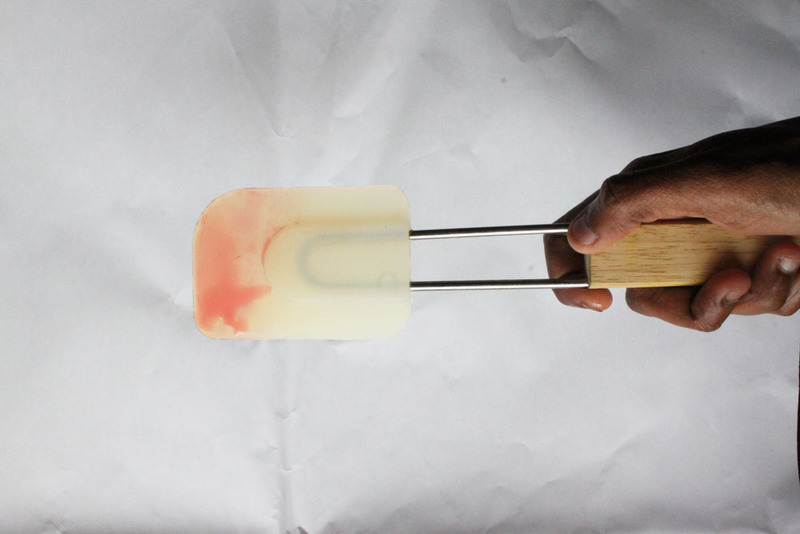 Poke an ice-cream stick into the ice and place in a bowl. *If you don’t have an ice-cream maker, these instructions always work well for me (scroll to the part with the coconut milk-cream. It is in the last paragraph). You will just need to do this for an hour instead of the 3 hours mentioned, just because this is for shaved ice and not ice-cream. 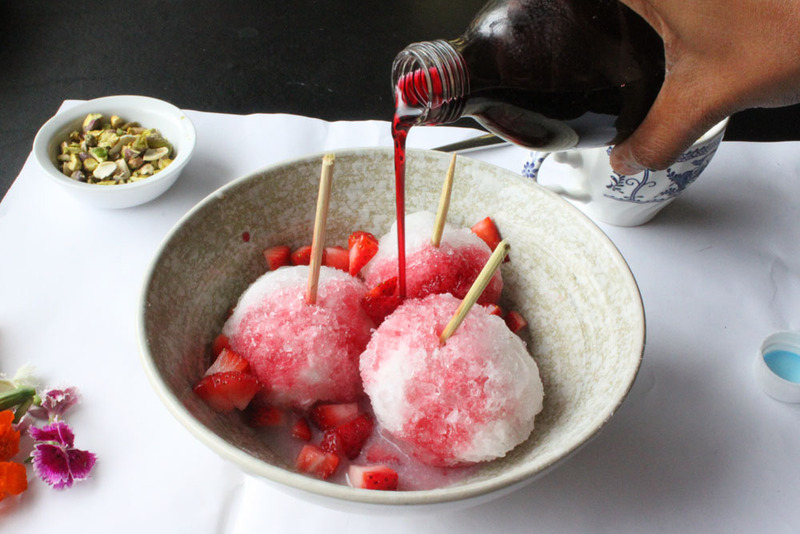 Place the cut strawberries around the gola/shaved ice in the bowl. 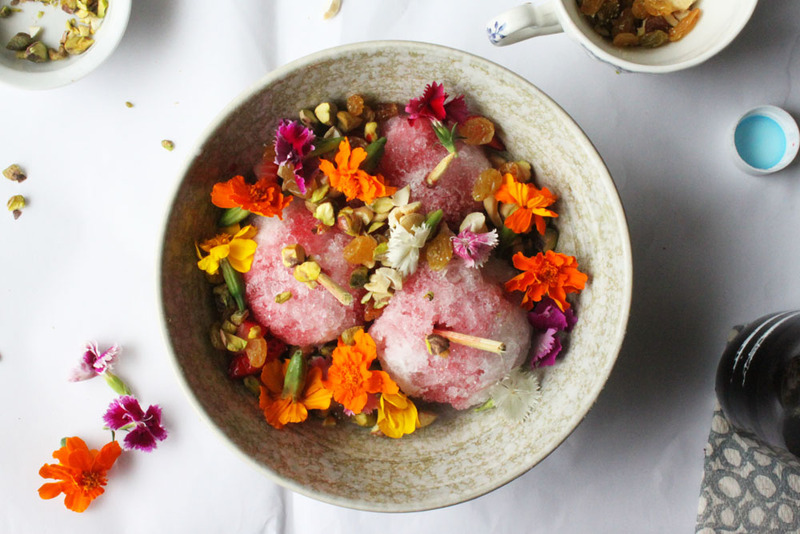 Top the ice with the hibiscus syrup, depending on how sweet you want it to be. Sprinkle the chopped pistachios and cashew nuts on top along with the raisins. 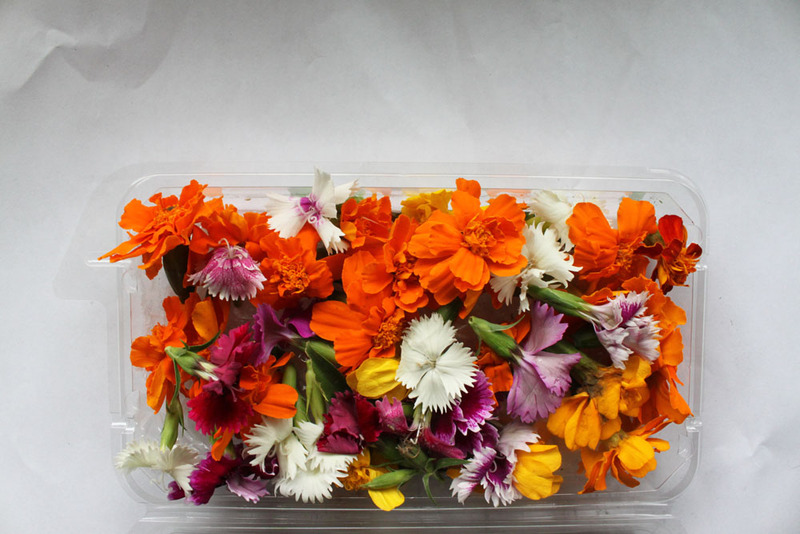 Finish the delicious presentation with fresh edible flowers like carnations, marigolds, nasturtiums, chamomile etc.